The Samsung C3300K Champ is a stylish phone with features that will enthrall you. It is a music centered smartphone with a 2.4 inch TFT QVGA full-touch display. The Samsung C3300K Champ is equipped with a sound-alive 3D effect which offers Wide, Dynamic & Surround mode. The earphones and dual loudspeakers enhance the music experience in the Samsung C3300K Champ. The Samsung C3300K Champ sports the crystal design chassis found in Samsung Televisions. The Samsung C3300K Champ sports the Touchwiz Lite 2.0 interface which allows easy and fast navigation. The high capacity 1000mAh battery offers 12 h of talk time. 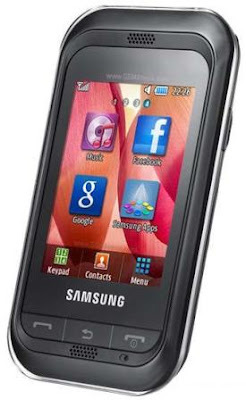 In addition to the above features, the Samsung C3300K Champ sports the Cartoon UI coupled with Touch Wiz Lite 2.0 which facilitates seamless menu navigation. The phone has internal receiver with support for FM and recording options. The MP3 player adds to its appeal making it an ideal buy for the music aficionado. Great music options and other impressive features are available at an affordable price of Rs 4,052 /-. The Samsung C3300K Champ has user friendly features and technical affability that make it a great buy.